Whether it's a birthday, anniversary, family reunion, graduation, or any number of other special events, millions of people flock to Walt Disney World as a place to celebrate with family and friends. And, why not? 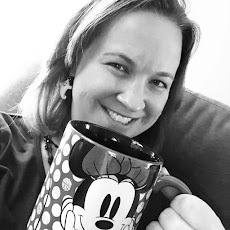 There is simply so much magic and pixie dust waiting here, it's easy to walk around with a big smile on your face and feeling like a kid again. To make your special occasion even more special, there are a few things to take note of when planning your Walt Disney World vacation. Everywhere you go in Walt Disney World, you'll be able to find free buttons from cast members that make your special occasion visible to the world. Don't be surprised to have Disney cast members congratulating you throughout your visit. There may even be some special experiences they make available to you to help you celebrate - from a free dessert, to an extra FastPass, and maybe even something as unique as being selected as the family of the day! When you want to add your own special touches to a celebration at the parks, you can reach out to Disney Floral and Gifts. From their website, you can order balloons, gift packs, cakes, and so much more to be delivered to your room. Regardless of whether your a kid or an adult, these treats are certainly unique (albeit expensive) ways to celebrate while in Walt Disney World. 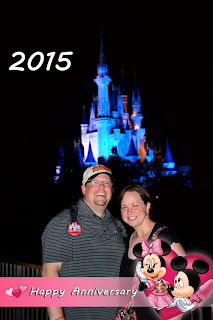 Baby on board - Disney style!! Outside of the Walt Disney World family, you can also check for unique shirts to highlight your achievements from several Etsy sellers. 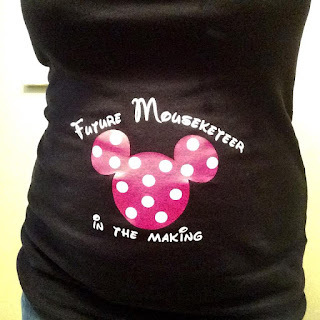 When I visited Walt Disney World during my second pregnancy, I found maternity shirts on Etsy that celebrated my little mouseketeer in the making! Like the buttons, this becomes a great visual reminder of what you are celebrating throughout your stay. Disney adds a touch of magic to any celebration and there are lots of ways to celebrate in the parks!